The famous traveler, mountaineer and cinematographer Stipe Božić, made a documentary film about the world’s greatest travelers of all time, Mate Šimunović. 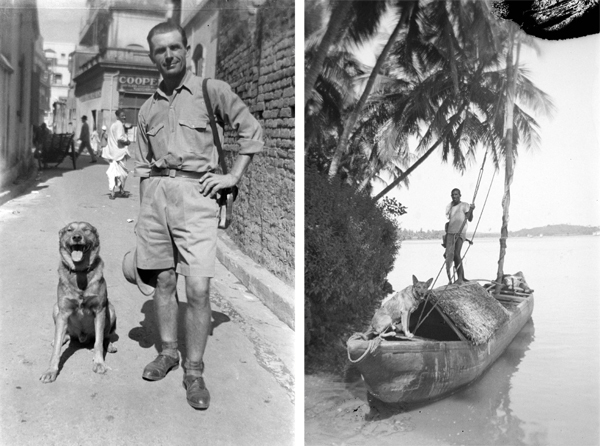 Mate Šimunović (1900-1969) is a world traveller who traversed a distance of 360 000 kilometres either by bicycle, on foot or in a small sail boat. He travelled for 19 years and visited 70 countries. All that time he carried a leather-bounded journal in which a lot of his eminent hosts have registered. All the reputable newspapers of the time wrote about him, such as New York Times, La Prensa, El Telegrafo, The Straits Times, Shangai Herald, etc. When his little sail boat capsized in front of Sumatran coast, his dog Globus saved his waterproof linen bag which held his diary and hundreds of negatives that he took during his travels. It can be seen from the remaining materials that he has no peer among today’s adventurers and the photographs he took bear witness to the world which no longer exists. After 19 years of travelling, Mate reached Egypt, from where he went back to Bakar on a vessel called ‘Podgora‘. The next day in Zagreb he was arrested by OZNA (The Department of National Security; the security agency of the former Yugoslavia) because he photographed a group of women who were queuing in front of the shop which sold pin-dot garments of clothes. After having crossed the whole world, travelled across the wildest of sceneries and outsmarted many border troops, now he could not leave Yugoslavia. He was constantly under suspicion and taken into custody. His dream of making a documentary feature film, for which he had Harry Truman’s support, before he became the President of the United States, has vanished into thin air. Till the end of his life he worked in Vjesnik’s newspaper and cigarette stand in Vrgorac where he would retell the memories from his travels and show his travel book to those who were interested. Because of that he was nicknamed Mate the Cosmopolitan. In the fifties a number of contemporary papers published articles about his travels. And then he was forgotten. He died in 1969 and was buried in Stilja, his home village. Mate Šimunović was one of the few people who, after almost two decades of being absent from Croatia, returned to his homeland. His family and friends were delighted for having him back, but the little village of Vrgorac could not quite understand why Mate did not gain fortune. The only thing he brought back was a bag with a huge book and a suitcase filled with photographs and negatives which he shot all over the world. A few people of the period could grasp that Mate Šimunović – the Cosmopolitan brought a greater treasure than all of his predecessors who were also returned emigrants. He brought back an impressive collection of stories about his pioneering accomplishment. Those stories are a monument to one of the greatest, not only Croatian, but world’s globe-trotters.